SEOUL -- The shine is starting to come off South Korean President Moon Jae-in's engagement strategy with the North. The liberal politician, who reversed nearly a decade of conservative hard-line policy toward North Korea after his election last year, is preparing for a third summit with North Korean leader Kim Jong Un amid growing public skepticism about his approach. Moon, who goes to Pyongyang on Tuesday, has seen his approval rating fall to 49 percent in a recent Gallup Korea survey, the first time it dipped below 50 percent since he took office in May 2017 promising better ties with North Korea and political reform. 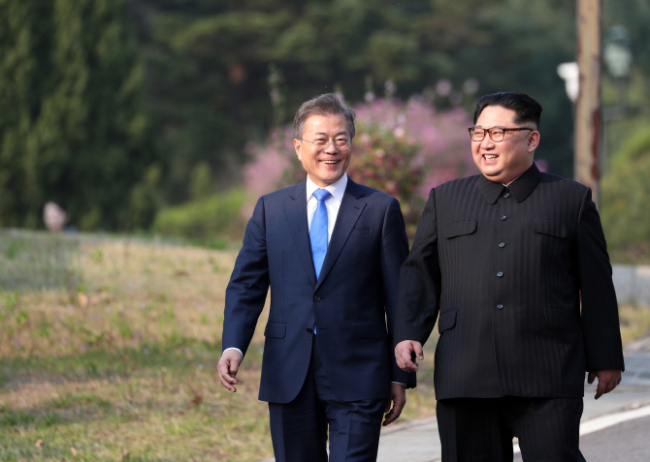 Moon's approval rating stood at 83 percent after his first summit with Kim in April. South Koreans are divided over whether this week's summit in Pyongyang will help break a stalemate over nuclear diplomacy between the U.S. and North Korea, according to another survey released in early September. By comparison, surveys after the April summit found overwhelming support for Moon from a public fascinated with the historic handshakes, border crossings and other dramatic scenes the two leaders produced after years of rising tensions. "Our people are beginning to learn that North Korea will not easily give up its nukes, something that many experts had already repeatedly predicted,'' said Kim Taewoo, former president of the government-funded Korea Institute for National Unification in Seoul. Moon may face increasing difficulties if his summit with Kim in Pyongyang fails to make tangible progress on efforts to get North Korea to scrap its nuclear weapons program. Economic woes such as a lackluster job-market growth and soaring real estate prices are compounding Moon's problems, adding to opposition to his North Korea policy, many experts say. Moon knows how important public support is for his North Korea policy. Most major detente projects with North Korea started by his liberal predecessors during a 1998-2008 ``Sunshine Era'' were suspended after conservatives took power. Moon hasn't been able to revive them because of U.S.-led economic sanctions on North Korea. Liberal presidents Kim Dae-jung and Roh Moo-hyun endured withering conservative criticism that their little-strings-attached shipments of aid and cooperation projects with North Korea helped finance the North's weapons program. Moon served as Roh's chief of staff and was in charge of preparations for Roh's 2007 summit with Kim's father, former North Korean leader Kim Jong Il. South Korean politics is characterized by a fundamental conservative-liberal divide over how to view North Korea. Liberals consider the North one to reconcile with while conservatives see it more as an enemy state that poses a significant security threat. Moon's conservative predecessors, Park Geun-hye and Lee Myung-bak, faced harsh criticism from liberals that their hard-line stances only led North Korea to carry out more weapons tests and attacks such as two in 2010 that killed 50 South Koreans. Opposition to Moon's North Korea policy was initially weak, partly because the conservatives were in disarray following a corruption scandal that led to the ouster of Park, Moon's predecessor. A conservative backlash erupted when Kim sent North Korean athletes and top officials to the Pyeongchang Winter Olympics in South Korea in February, including a former spy chief blamed for the 2010 attacks. But any criticism was soon overshadowed by the April summit, which also improved Kim's image in South Korea _ in one survey at the time, 78 percent of respondents said they had faith in the North Korean leader. Now, as nuclear talks between the U.S. and North Korea stall, conservatives feel vindicated and emboldened. During a Cabinet meeting last week, Moon said he needs not only strong international support but also ``nonpartisan backing at home'' to help make next week's summit produce a major step toward denuclearization. ``Please, lay aside partisan politics in the face of these kinds of important things for Korea,'' he said. Moon even asked conservative opposition leaders to travel with him to Pyongyang for the summit, but they rejected the offer immediately. "Given that North Korea has not taken concrete denuclearization steps even after two inter-Korean summits and one U.S.-North Korea summit, it's overly excessive to ask us to go to Pyongyang,'' said Yoon Young-seok, a spokesman for the main opposition Liberty Korea Party.